My wife has never been to the Blanton Museum of Art. Not surprising, really. I’m guessing most people are busy and locked into a repeating pattern. I too was tucked away safely in suburbia, until photography and blogging unlocked my curiosity. I’m hoping events like Austin Museum Day will entice more visitors. While my wife admitted that she prefers Natural History Museums, she enjoyed the Blanton more than I thought. She liked the classic European Art and was less enthusiastic about the contemporary. I’ve seen the permanent collection several times and was interested in two new exhibits, which I’ll talk about in upcoming posts. But, of course, true to form, I’m always taking pictures. A. B. S. Always Be Shooting. I already admitted that I often like museum architecture more than a museum’s contents. But, second to architecture, I like shooting people in museums. Great choice of artwork to photograph Andy. 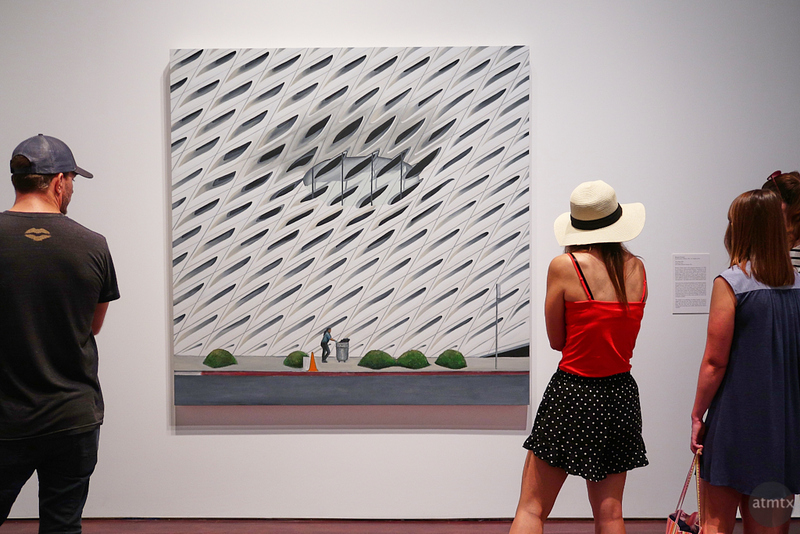 A photo of a painting of the Broad Museum taken in the Blanton Museum, that’s kind of meta, I like it. Well done. Is this Gomez painting part of the permanent collection or was it part of one of the two new exhibits you mention? Have you been to the Broad Museum in LA? If you have and you’ve posted about it, I’d like a link just to see your take on it. It is quite an amazing piece of architecture. Thank you, Cedric. It is meta, I guess. But, you give me too much credit. It was accidental. I have not been to the Broad Museum. Maybe in the future. I’m not sure if this is part of the permanent collection, but this is not one of the two new exhibits I explicitly came to see.